Many veterans rely on state benefits to help during these tough financial times, but it turns out not every veteran is treated the same in the state of Connecticut. Samuel Guerreri says he doesn't get the same benefits as other veterans because he's considered a peacetime veteran. "I think it's discrimination against me and the people that served the country when I did," he said. Guerreri is specifically talking about the state's property tax exemption for war-time veterans. According to the law, veterans receive a $1,000 break from the assessed value of their home or car. On average, it is a savings of $30 a year. It's not a lot, but Guerreri says it's a lot to veterans like himself. A Connecticut veteran who served more than a year overseas in Korea claims the state is discriminating against him because hes being denied some benefits. 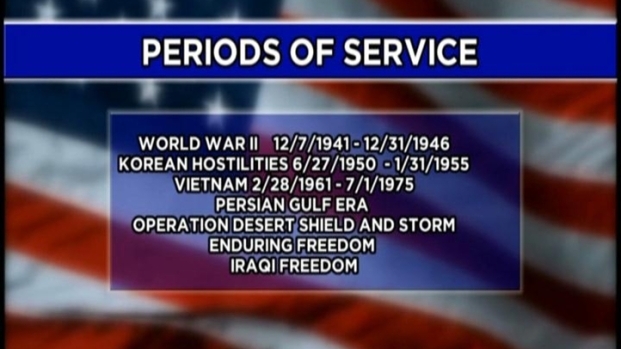 Vets must have served during specific war dates, though, to be eligible. It's a law that has been on the books since 1949. Guerreri's senator, Gary LeBeau, thinks it's worth another look. He plans to recommend that the veterans select committee discuss a possible change in language. He also wants to hear from other veterans groups about their thoughts on the matter. Other lawmakers plan to introduce legislation that would open up the tax exemptions to every veteran. For his part, LeBeau says he considers peacetime vets, like Guerreri as much a veteran as his war-time brothers and sisters. "You have to have a peacetime force ready to go to war. You have to have a peacetime force, even if it's a skeletal force that's ready to be mobilized and to go," said LeBeau. Connecticut's Veteran's Affairs Commissioner Linda Schwartz previously fought to allow all vets, wartime and peacetime, to be buried in the state's veterans cemetaries. She says the tax exemption though may be a tough sell especially during the current fiscal crisis. "We have about 60,000 peacetime veterans in the state of Connecticut that haven't served in time of war. If they wanted to approach their legislator about it, I know that in past sessions this has been approached, but it has never gotten much support," Schwartz said. Vets like Guerreri say that's hard to believe and feel it boils down to treating the men and women who have served our country the same. "I served my country, I put the uniform on. I froze in Korea," said Guerreri.